What Type of Kayak Should I Hire? Kayaking is one of the most relaxing, yet enjoyable water sports in existence. It’s the perfect choice for those looking to get close to nature and to experience it in a special way. Kayaking in Jervis Bay is one of the best ways to encounter the region. We’re known for our spectacular coastal scenery, including sparkling aquamarine waters and abundant wildlife. There’s no better way to see these elements up close than with a kayaking tour and Jervis Bay Kayak Hire are your local, trusted experts. The toughest decision now is selecting which type of vessel to hire. What type of kayak should you choose? A double kayak is undoubtedly a cute seagoing vessel. Two people paddling in tandem is a fun experience—and great for bonding! If you’re a duo interested in kayaking Jervis Bay, you may want to consider the double kayak. It’s a good option for those who want to sightsee together, as being in the same vessel keeps you close and lets you communicate super easily. It also means that you can take turns paddling, giving the other person an opportunity to snap some photos or simply relax. Couples love the double kayak–especially honeymooners! Double kayak hire can also be the right choice if one member of your party is a bit nervous about kayaking. This person will likely feel more comfortable with a more experienced partner in the same boat. And this makes double kayaks a great option for paddling with children, too. Keep an eye on the kids as you explore the coast as a family. For the quintessential paddling experience, single kayak hire is right for you. With this boat, you’re in total control of where you go and how quickly. Of course, you’ll need to use extra man power since it’s only you at the paddles, but the independence of manning your own kayak can’t be beat. Many of our guests prefer the single kayak as this allows them greater manoeuvrability and precision on their trip. It’s also fun to paddle side by side with friends and family in neighbouring kayaks. Perhaps a friendly race is in order? Stand up paddle boarding presents a fun challenge for the traveller looking for a unique experience. On these wide boards, you stand up whilst paddling through the water. While it takes some practice at first (and a touch of abdominal strength), soon you’ll be using the SUP with ease. And you’ll find this type of board to be extremely fun. You’ll still have the opportunity to view Jervis Bay wildlife and admire the scenery, but SUP hire adds an exciting twist on your typical paddling experience. Why not try it out on your next visit? 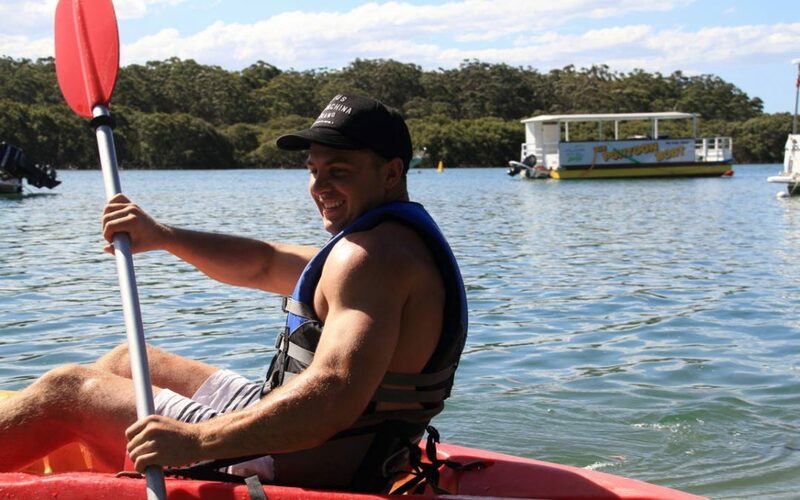 For exploring Jervis Bay by kayak, there’s no better outfitter than Jervis Bay Kayak Hire. With years of local experience, our team is ready to help you have the best possible experience. And don’t forget, we also offer guided kayak tours. These 2.5 hour tours bring you to the loveliest natural spots in the bay as you’re taken past towering sea cliffs and pure white silica sand. Your knowledgeable tour guide will point out spots of interest and answer any questions, too. Wildlife sightings, while not guaranteed, are often a regular treat during your kayaking adventure. Ready to climb onboard? Jervis Bay kayaking is one of the finest ways to experience the region. Book soon to reserve your space.